Maybe it was as much as 10 years ago when I first came face to face with a multi-tool. The Fein company had done a great job inventing this tool but somehow it didn't register as something I'd ever need. Quite a bit has changed since then. Multi-tools are stock items for the bigger brands and with them a cordless variant. 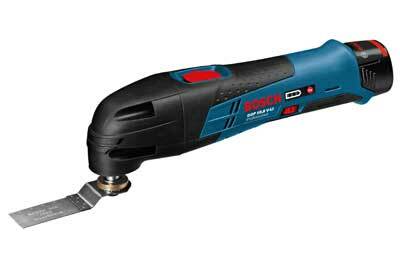 The Bosch GOP 10.8 V-Li is not going to set the world alight with its phenomenal power - 10.8 is hardly earth shattering - but it puts the tool into perspective. Like a sonic screwdriver, the multi-tool is versatile in the extreme and while not outstanding or great at any particular task, it is capable of many. For anything other than crude thin stock woodworking the multi-tool's attraction is limited but for sanding, shaping, grinding and nipping through nails, they have real attitude and a cordless version makes them all the more handy to have around.